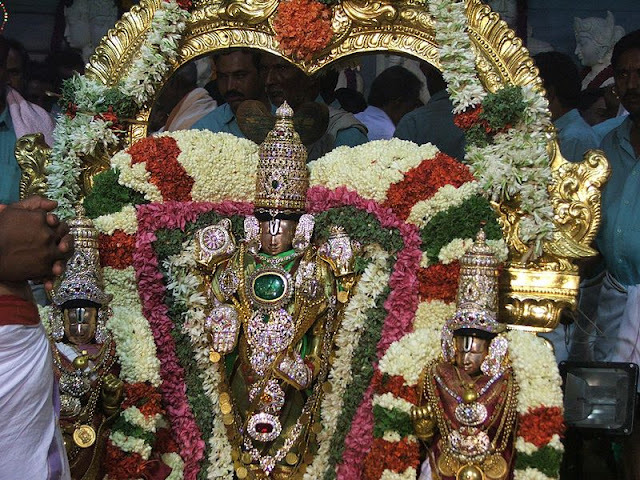 Malayappa swami along with his consorts Sridevi and Bhudevi during the annual Vasanthotsavam ceremony. It was not the first time I was climbing those steps. Crowd were moving in both directions in search of stairs to come down. In that moonlit night, road below the bridge looked much cleaner that the floor of over bridge coloured remains of chewed pan. I was not at all in any hurry, after all time was just 8.30 my bus will come in only at 9.30pm. Hence I walked as slowly as possible towards the other end. Continuous stream of noise was coming from my left side. It must be from some construction site, but who is working late in this night? Let’s take a look. Some hundred feats away machines were digging deep in to earth for creating a lengthy channel for Namma Metro. Many workers were playing with their machines which obediently moved materials to distant dumping sites. Who knows how many more years are required for Namma Metro to complete the work? After taking a deep sigh I walked towards Karnataka RTC Bus stand in Majestic. as seen from Srivari Padalu on Narayanagiri hill. I stared at my ticket once again. Where the hell is this platform? One conductor asked me to go to other end, pointing in a direction. My eyes followed his finger and saw moon. Is he really pointing to moon? I didn’t try to clarify my doubts. After a while, I came across a policewoman sitting in a remote corner. She gave me more earthly direction. In short, I went in to wrong bus terminal. Took the stairs again to go to the other end. Here another conductor solved my problem – felt like I got a jackpot. That was also a wrong terminal but the good thing was I came to know where I have to go. Mind you, getting a bus is not an easy task. Another ten minutes, finally I reached the third terminal and yes, platform number mentioned in the ticket is there. I can’t say whether Edison was happier after inventing the tungsten filament or I am after finding out the platform. Why I am reserving tickets in ordinary buses? I don’t know, may for surety I like to do that. I killed some more time by trying to read place names written in Kannada. After a while I dropped this exercise and sat in the platform waiting for my chariot. Finally my red chariot came, that too in time!!! However, this efficiency didn’t remain till the end - 20 minute late in moving out. Much more time and energy wasted in the struggle to move outside the Bangalore city limits. After more than one and half hours hard effort we crossed the borders of Bangalore city. Did I tell you where I am going? Ok. Let me break the surprise. My destination was Tirupati-Tirumala Venkateshwara Swamy Temple, and from there to draw a big diamond across the vast stretches of Andra connecting – Sri Kalahasti, Vijayawada, Warangal and Hyderabad. Three full days in Deccan heartland!!! Guy sitting next to me was from Tirupati, it’s become my habit to ask the prized T question to any one from Andra. T? Yeap.. Telengana. Here too I was not able to resist my temptation. He talked a lot about Hyderabad, Tirupati and Bangalore (where he spent his last two months and probably coming months as well). As I was going alone in my first ever trip to Tirupati, I needed a lot of details, which he was very happy to supply. It’s time to sleep. There was no push back, in those situations I generally don’t prefer to sleep in same position for more than an hour. If those KSRTSC people can give some more foot space... Finally we reached Tirupati Saptagiri bus stand by 4 in the morning. My new found friend, after much searching, arranged a shared auto for me – 20 INR to Alipiri (If one want to Tirumala by foot, they have to get down here and use walking path to Tirumala). Soon I reached Alipiri. There were so many people in different queues. Which one to join? After walking here and there for a while finally find out of that building. Queues inside the building were for lockers. The other queue was for walking. Used the underpass and reached the other side. I was very much interested in walking, but my knee forced me to think again. Eventually, I came back to road and boarded a bus going to Tirumala. We didn’t go much, bus stopped again. This time for a security check – manual plus x-ray scanning. After that we again boarded the same bus to Tirumala. Both sides of the road made a festival for eyes. Cool atmosphere, misty air, lush green valleys, zigzag roads etc was really a nice experience. Soft sun rays coming from eastern mountains were drawing patterns in the sky. Whenever my eyes were opened (for a while I was sleeping) I tried to take a full look around. Finally bus stopped for the last time. Yes, It’s Tirupati. Got down from the bus and washed my face. Carrying bag and camera I can’t go inside. Here comes the role of luggage room (officially PACs). After searching for a while I reached in front of one such building, but it was full. They told me to go to the next one. Thus I reached - PAC 3. OOPS.. Somewhat long queue was already formed there. It was moving frustratingly slow, so slow that you can take full rest (in case you got a chair) for every feet moved forward). I appreciate their efforts in making sure the safety of our luggage (facilities are there to make photo identification card on the spot), but that much time!!! After moving forward some feets in every quarter an hour it finally stopped. I sat in the chair and slept there itself, when I woke up after some 30 minutes queue was not at all moved. Again went for next sleep. In total it took three full hours to get a locker. By the way you have to pay some 350 INR for locker (it’s really big enough to put all your bags) facility. This is fully refundable. From which end I can enter the temple? After searching for another 10 minutes and checking with a number of people, finally I joined at the end of special queue. This is special because one has to pay money for using it. In the beginning it was fast, we were able to cover a lot of distance in short span. The queue itself was very long, sometimes we had to go up, other times coming down. This process repeated multiple times. Finally, after a number of hours we reached inside the temple. After darshana, and completing ‘pradakshina’ I sat on a side. Later newspapers reported that, that particular Saturday was one of the busiest in Tirumala and many had to wait for more than 30 hours for darshana. Suddenly I remembered about my trip to Hampi. There in a museum it is mentioned that, original statues of Krishnadevaraya and his two queens are located in front of Tirupati Temple entrance. It didn’t take much time for me to find out the original ones. Next task was to get Tirupati Laddus. Another long queue!!! How can one leave Tirupati without getting laddus? So I joined the queue. Cost for one laddu was 25 INR. For special darshana ticket which I bought earlier I would get two laddus. After doing much addition and subtraction finally I reached a number – 16 laddus. Person sitting on the counter thought otherwise, pouring cold water in to my dreams he told that – in queue you can buy only 4 laddus. I turned back and looked the queue again, and then settled finally for four laddus. Friends and relatives had to satisfy with smaller pieces!!! After coming out of the main temple, my next destination was PAC 3 - to collect bag and camera. It is located on other end but close to bus stand. After standing for many hours not much energy left in me for walking and taking photos. Someway climbed all the steps and reached PAC3. Here one can see many vendors selling different items - including but not limited to photos, caps – in road sides. Many APSRTC busses were parking on one end of that ground. I walked towards one which was standing first – about to leave. There were no empty seats, so had to settle some space left on top of engine cover. Driver gave some old newspapers for some comfort from the heat regularly produced by that mammoth engine. We took another way to come down? Path of a dried up stream was visible on the side. In those last days of summer, forest also showed a kind of tiredness; there was little moisture on the soil. I was confused, whether to continue my journey to Vijayawada as planned or to go back to Bangalore. Finally, packed by bags for a return trip and bought a ticket in a KSRTC bus going to Bangalore. Sitting close to the engine created continuous disturbance to ears but for getting a panoramic view of what lays ahead I had to do that. My eyes once again scanned Tirumala Hills and then went in to sleep mode. Suddenly bus stopped; I woke up and looked around. We were not in Bangalore. So what happened? Why it stopped? Dead body of a bike rider was lying in a pool of bed at one side. It happened probably some minute ago. After 10-15 minutes later we reached another accident spot – this time no dead bodies. However one kilometre further down, on road side lays the remains of a burned bus (this accident, happened in that morning claimed three lives). After midnight Majestic area looked like a ghost city; I crossed the road and reached BMTC stand. A couple of drivers standing in the road called me. Well, I am ready to take my changes. In case bus is available I prefer that. With these thoughts I entered in to BMTC stand. To my horror, it looked like a graveyard; there was not a single person, not even a dog. Finally, I crossed the stand and reached other end. Two KSRTC buses (to Hosur) were standing there (waiting for me?). When I reached room, clock was almost ticking 2am. 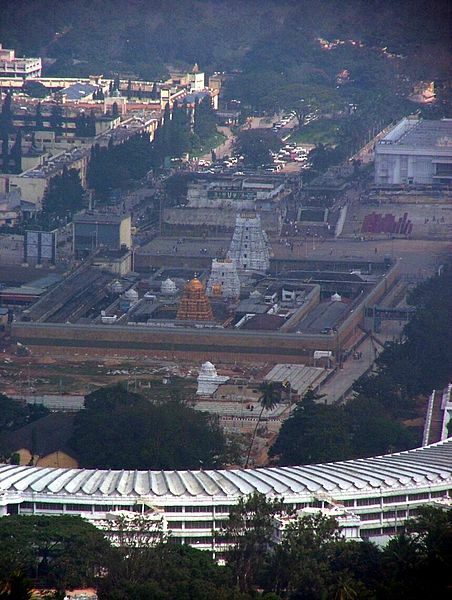 Tirupati is connected by road to Chennai, Hyderabad, Vijayawada, Visakhapatnam and Bangalore. Public transport corps like Tamil Nadu's TNSTC, SETC; Karnataka's KSRTC and AP's APSRTC operates a good number of services to Tirupati. A lot of private bus services are also available. From Tirupati a lot of APSRTC buses are available to Tirumala. 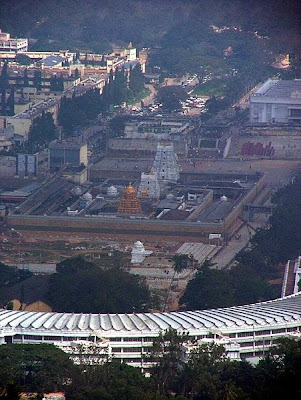 Tirupati Main is well connected to cities like Chennai, Bangalore and Hyderabad. It is also connected by Chennai sub-urban railways in North-western line. Renigunta junction which lies on Chennai - Mumbai rail line, is 15 kms away from Tirupati city. Tirupati Airport is located 15 km from the city and has flights to Hyderabad, Visakhapatnam, New Delhi via Hyderabad, Coimbatore, Kolkata, Mumbai via Hyderabad. The closest international airport is Chennai (130km).